JANESVILLE — "Did you ever see a lassie, a lassie, a lassie? Did you ever see a lassie go this way and that?" 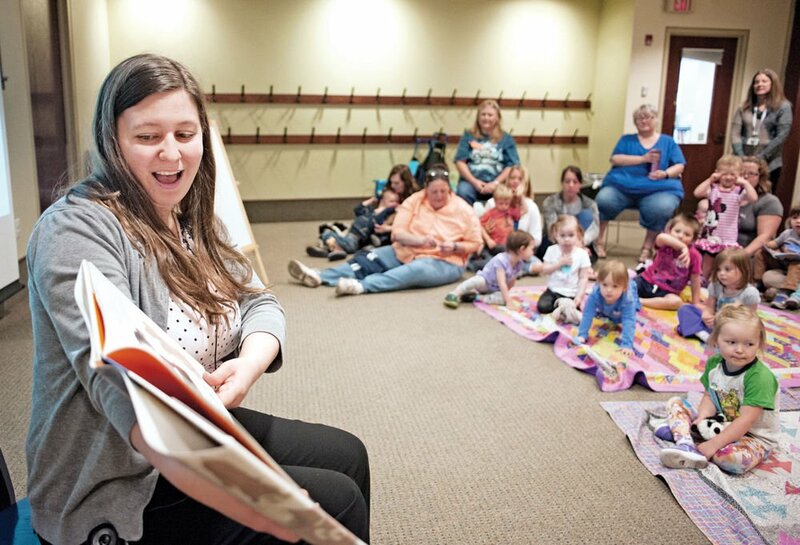 Hedberg Public Library's Tales for 2s and 3s story time begins with an interactive song that helps "get the wiggles out," says Maria Dietrich, youth services librarian at the library. Children, and the adults who brought them, sing the song, dance and follow instructions set forth by Dietrich. It's important to keep the children engaged, especially the 2- and 3-year-olds, she said. "It's kind of the main focus," Dietrich said. "It is a family program, so it's nice to have some movement in between stories." Speech and language experts say early language development correlates with the amount of interaction children have with adults. Reading to a child is one of the best ways to provide that interaction. The theme of Dietrich's class last week was "food favorites." After the song, Dietrich moves into discussing the importance of early literacy with parents on-hand. She then reads, sings songs and has interactive discussions with the children about food. The story times are as much for parents and guardians as it is for the children, she said. "Early literacy is a big part of everything we do at the library," Dietrich said. "It's mostly getting them ready to read. That can mean getting the kids excited about reading and working on all those little skills that most people are doing anyway, but maybe not realizing the connection. It is so important for children beginning to read to point out words in the book and what they are and all those little things that we can share with the parents in story time. We give them suggestions of things they can do at home." Dietrich is one of three youth services librarians who run the story time sessions, she said. During the story time, parents are also introduced to a smartphone app called Peek-a-boo fridge that helps children identify and name items in the refrigerator. Dietrich even gives the parents "homework" by telling them to make a meal with their child while practicing and talking about each ingredient in the recipe. Human interaction is vital for speech development, according to experts, and parents play a vital role in that capacity. "Reading to children is like the mother's milk of language development," said Steven Long, associate professor of speech pathology and audiology at Marquette University, in November. "It's all-around good. To read them a book, show them a book, point to things, it promotes vocabulary development and pronunciation skills. They aren't learning to read at that point but learning speech at a very young age." Most children start making sounds within a few months after birth. They say their first words between 6 and 9 months old and begin combining words at 18 to 24 months. Sarah Acker has three children aged 5-,3- and 1-years-old. She takes them to story times at the library because she agrees that reading is important for their development. "It's pure enjoyment for the kids," Acker said. "Each of the story time leaders do age appropriate things to keep the kids involved." "They give such great tips here to learn vocabulary," she said. "They really make it fun with music, apps and books. We moved here about three years ago, and I was thrilled with the children's department here. It's a great way to start kids off being involved with the community and helping them with their social skills and with reading." Carol Goldstein brought her 2-year-old granddaughter Abigail to story time at Hedberg for the first time last week. She said her family reads to Abigail, but she believes the interaction she receives with other children is beneficial to her development. "We read a lot to her already, but it's good for her to have the interaction with the other children," Goldstein said. "They interact with the other children and learn from their peers." Janesville isn't the only place to offer childhood development at the library. 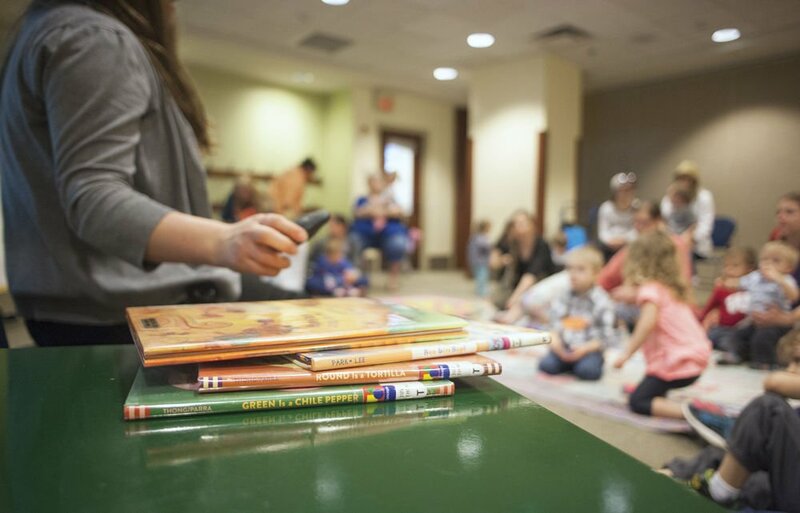 Other local libraries such as Whitewater, Clinton, Evansville, Edgerton and Orfordville, among others, host children's programming. Hedberg also has programming for 0 to 12-month-olds, 12 month to 24-month-olds and 4 to 6-year-olds, Dietrich said. The programming is year round with a few breaks throughout the year and free to attend, she said. "We have a story time for every age group, so a lot of people will start with the baby lap sit and kind of work their way up as their kids grow up," Dietrich said. "We've done some surveys, and parents seem to really enjoy the story times and the extra information and the excitement and positive experience around books."